commuterDude: Team commuterDude, plus Jerseys & T-shirts! Team commuterDude, plus Jerseys & T-shirts! 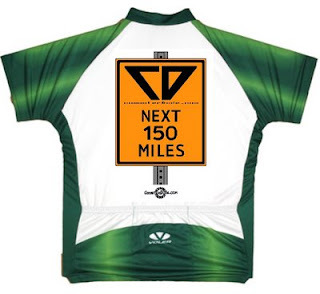 Click here for more information about our MS-150 team! Join us for 150 miles, 2 days, and lots of smiles! This is our 4th year as a team - join the action!!! We'd LOVE to have you along! DEADLINE FOR JERSEY & SHIRT ORDERING was Friday August 8th, 2008 at midnight - ordering is now closed! 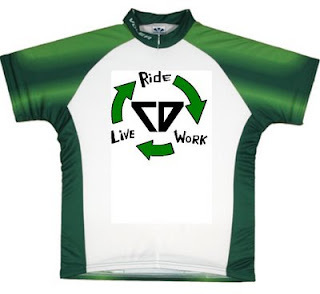 Pre-order your very own Team commuterDude cycling jersey or t-shirt - see below! Click here to Email the Head 'Dude for jersey details & team details TODAY! JERSEYS: Above are the back (left), and front (right), views of the offficial 2007-2008-2009 Team commuterDude MS-150 cycling jersey. These jerseys are manufactured by Voler (http://www.velowear.com/) - and are simply top-notch. No two ways about it, these are extremely comfortable jerseys, pro quality, 3/4-length zipper, three back pockets, high collar, fully sublimated (that means it's produced by forcing gas dye into the fibers, for logos that are part of the fabric - as opposed to laid on-top-of the fabric, like a cheap iron-on. These are how all pro jerseys are made.) Jerseys of this quality are currently running about $80-$120 in most retail bike stores -- if we can secure a quantity order for our team of 16 jerseys, your cost per unit is only $59.99. As anyone that purchased them last year can attest, it's an absolute bargain! You simply can't get fabric of this level at that price, even in a plain, solid color. T-SHIRTS: As a value alternative to the jerseys outlined above, Voler also offers custom T-shirts! These are manufactured by Hanes®, called Soft L'ink™ This is an athletic, highly breatheable tee, designed for all outdoor activies, made from a two-layer process that is designed for sublimation, the same process that gives jerseys that 'designed-in' look and feel. This is NOT a cheesey iron-on - this process makes the logos part of the fiber, and they will never fade! A looser fit, comfy on or off the bike - perfect for the MS-150 weekend, and beyond! There is no quantity discount here - but they're still a bargain at ONLY $16.95 each! Our total quantity for each of the categories is totaled together to calculate the quantity price break for the category. SO, If we order 6 Short Sleeve and 1 Long Sleeve Jersey, your final price would be based on a quantity of 7 items. You would then pay $63.95 for each S/S item and $78.95 for each L/S item. So, if you want to order a long-sleeve, or a Tri shimmel, go for it! We still get the discount for the total quantity of the entire order! I will handle the shipping. If you are ready to place an order for a jersey or a T-shirt, EMAIL ME TODAY! Deadline for ordering was August 8th, 2008!